Qimonda 16GB (2X 8GB) 4RX4 PC3-8500R 1066MHZ IMHH8GP22A1F2C-10F. Form Factor: 4Rx4 DIMM 240pin Quad RANK. 16GB kit (2x 8GB) DDR3 PC3-8500R ECC 1066MHZ, 4Rx4 Quad Rank. 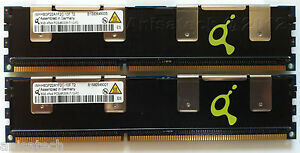 Type: DDR3 PC3-8500R (1066Mhz). Immediate payment of £113.95 is required.